The species’ main color is silver-white to pale green. Its back is dark, with white sides and belly, and with narrow dark stripes running lengthwise on its sides. It has large, rough scales and two dorsal fins. The more anterior dorsal fin is much harder and appears to have spines on them. Although these are not true spines, this type of fin is called a spinous ray. The more posterior of the two dorsal fins is much softer and is thus called a soft-ray. 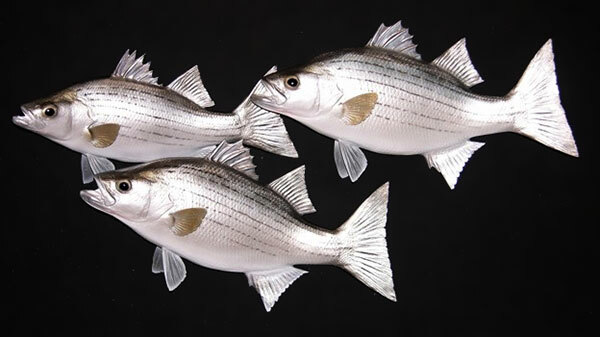 Because the vertebrae do not extend into the tail, the white bass has what is called a homocercal tail. The body is deep and compressed laterally. Most grow to a length between 10 and 12 inches, though they can reach 17 inches or more. Because the dorsal and ventral portions of its tail angle inward toward a point to create a clear angle, the tail is said to be notched. The record size for white bass caught on fishing tackle is six pounds and 13 oz (3.09 kg) shared by fish caught in 1989 in Orange Lake, Orange, Virginia, and in 2010 in Amite River, Louisiana.